Massages can be a great way to improve the overall health of your pet. It helps stimulate circulatory system functions. This is especially good for an older cat that is still healing from surgery. The stimulation keeps the heart and lungs functioning well and keeps the blood flow to all parts of their body. Regularly giving your pup a good rub-down will keep their nervous system in good working order. The stimulation helps their skin and coat health, while it also helps to remove excess fur that can get all over your furniture. A good rub-down helps to relieve a cat or dog’s boredom as well. Often, as our pets get older, they may become less active. Massages keep their mind stimulated and help refresh them so that they can continue to enjoy their time with you. With a good message, you can help your pet to maintain a healthy heart. Another advantage of massaging our pets is that it helps to stimulate their nervous system. With the blood flowing well, so too do their sensations. A dog can tend to lose feeling in their paws as they get older. Massages can help stimulate the nerves and keep them on all four feet so that they are not compensating to keep weight off their paws. Therapy-related massages can also keep the fluid flowing between the joints of an older dog or cat. This is especially helpful because arthritis tends to attack these areas and cause your canine or feline friend pain. They may not show it because they will shift their weight, and make their other legs work harder to compensate. Massaging can also be beneficial to digestion in your pet’s belly. The rubbing helps food along the digestive tract and keeps their body working well. By making sure they get a good rubbing, you can keep them lively and happy on your afternoon walks. You may ask pet massage therapists or your vet about how to massage your pet at home. Find out what kind of techniques you can use to help keep them healthy and active. Keep in mind that you will want to know what areas are sensitive, and spots to avoid while massaging so that you don’t irritate, or hurt your four-legged friend. Inquire what areas you should concentrate on and how to massage them. This is very helpful especially during recovery and the healing process after surgery. Overall, a good therapeutic massage has many health benefits for your pet friend. And, there’s also the emotional benefits, too. By rubbing and massaging between visits, you can build a solid bond with them, and keep them happy. Massaging keeps your pet in the best of form as they enjoy a long healthy life with you. How many times have you noticed your cat licking away at their own paws (feet)? You can do them a big favor by massaging the webbing between the paw pads underneath. This particular area is hard to reach by animals themselves. Again, your cat or dog may be scratching or licking their ears. Why not rub their ears for them? The outer ear is an area where you can never rub enough. As a tip, you can use your index and middle fingers to dig inside the cartilage (soft bone) that makes up the ear. There are many points you can massage inside the ears. Don’t think of them as yucky! In fact, if you clean your pet regularly, it is not as dirty as you would think. Stick your finger inside and rub your way inside the ears. Just make sure you wash your hands afterward. Many pets will lie on their back happily, with their paws up facing up, when you massage their stomach. There is one spot called the “ground zero” that you can massage to cause them to move their paws frenetically. Be careful with rubbing your pet, especially your cat because they might scratch you if you stimulate the wrong spot! Massage your pet’s knees and they will thank you for it (although they can’t show it). For 4-legged animals, their knees are like our wrists. When you massage your own wrist, it feels good, doesn’t it? The same goes for their knees. Rub their joints, reaching into the bones and tendons. 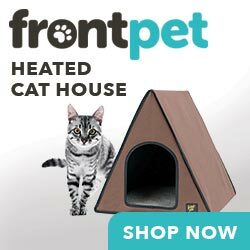 It will create a deep and comfortable sensation for your pet. Enjoy your massage and your pet will too. From the Author: Hi there! Welcome to Little Fat Kitten where I can share things I love about cats! I am Iris, a blogger, and a cat lover! More than just a cat lover, I am experienced when it comes to food, health, care or anything about cats. My blogs are an excellent outlet for me to share my love for cats and my experiences as well. I hope my blogs could help you – especially those cat lovers out there – to be more than just a pet owner and be the best friend to your cat! When could – or should – you use a pet stroller? Future Pets: Millennials and Pets 10 Tips to improve the human-animal bond When the going gets tough: do pet owners get going? When could – or should – you use a pet stroller?